Let us embark on a tour in the form of an agricultural festival celebrating the seven species with which this land has been blessed. Amidst the terraces and garden rows of early agriculture, we will discover the agricultural roots of this holiday. 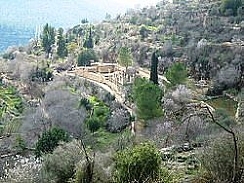 On the outskirts of <?xml:namespace prefix = st1 ns = "urn:schemas-microsoft-com:office:smarttags" />Jerusalem, on the steep slopes of green hills, are two natural springs that fed mountainside agriculture for generations. Agricultural practices of biblical times are still in use today for the planting and harvesting of this land. We will embark on a “green” tour that combines history, greenery, and flowing waters, and we will search out the seven species that have blessed this land. We will descend the mountain slope and wade in the cool spring waters as we learn about the holiday customs.